This year, during the month of May there are THREE public holidays, all falling on Thursdays (Labour Day, World War II Victory Day and Ascension Day). The 1st day of May is traditionally 'La Fête du Muguet' - Lily of the Valley Day. 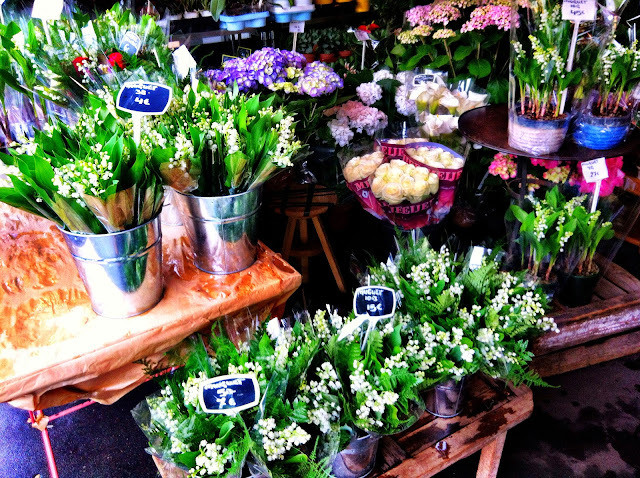 You will find sprigs of Lily of the Valley being sold all around Paris. People will walk around holding little sprigs, bouquets, pots of Lily of the Valley to offer to their loved ones as a sign of good luck and happiness, as well as to celebrate the arrival of Spring. This tradition started in 1516 when King Charles IX of France was presented with some Lily of the Valley flowers. He apparently liked them so much that he offered them to all the ladies of the court. Nowadays it is customary to give Lily of the Valley flowers to family members and loved ones on the 1st of May as a gesture of love and good luck. You'll find Lily of the Valley flowers being sold everywhere in Paris, not only at florists (well the florists that are open on a public holiday anyway). 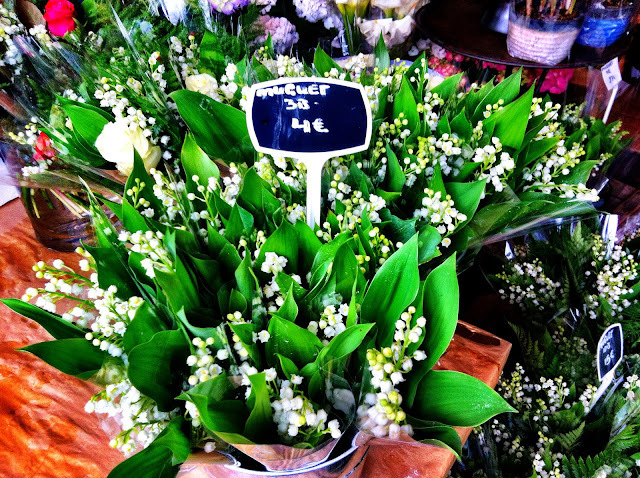 There are special regulations in place that allow anyone to sell Lily of the Valley flowers on the 1st of May, without having to pay tax nor obtain a special licence to sell them in the first place. You'll find little makeshift stalls set up all around Paris, in front of metro stations, in train stations, on the street, everywhere! 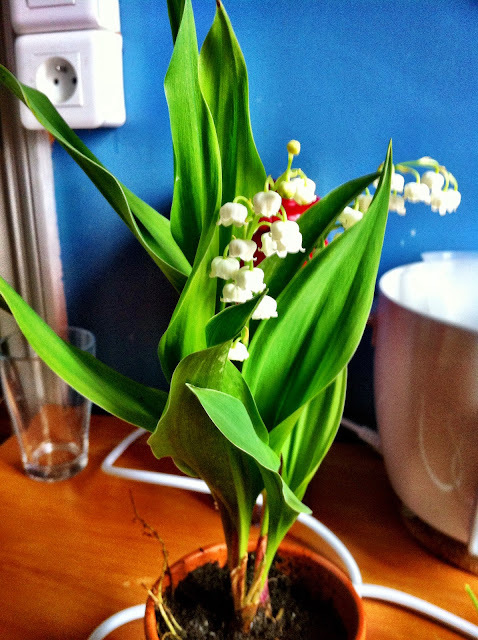 John brought home two Lily of the Valley pots for his daughter and myself to celebrate the 1st of May. This is mine sitting casually on the kitchen table. Just don't mind the glass and the rice cooker in the background.. The 1st of May is also Labour Day - La Fête du Travail. On April 23rd 1919, the eight hour working day was introduced in France, representing 8 hours of work, 8 hours of rest and 8 hours of free time. In the 1940s, the 1st of May became a paid public holiday to commemorate workers' rights in France and was often associated with protests and marches. Although having said that, I don't think the French really need a special day to march for something they believe in. They say protesting in France is likened to a national sport. I have even seen the French protesting on a Sunday, in the rain, with their children in tow. I remember thinking wow, they are protesting in the rain, on the weekend with their raincoats on.. But then again, I suppose it isn't too hard to believe because, well they did bring on the French Revolution after all..! Anyway, happy 1st of May everyone! Love to read your Blog Nhan! A very enjoyable short history lesson has slid through your beautiful article , well done! Thank you! I am a self-confessed geek, I love finding out the reason why things are done, where they came from, their origins etc. I am so happy you enjoyed the results of my curiosity :) will make an effort to share more!